In Tunisia, the Truth and Dignity Commission’s (TDC) public hearings have fundamentally changed discussions around the past. However, many in the country still view transitional justice as a “dream of the revolution:” there remains a real need to engage all segments of the population in the process especially historically marginalized communities like young people and women. Their stories are essential if Tunisia is to fully confront its past. In January, nine Tunisian women—some older who had experienced repression under the Ben Ali dictatorship and others younger and newly engaged in activism—gathered together at the University of Birmingham in England for a workshop facilitated by ICTJ and the University of Birmingham called “Writing the Unvoiced.” Its goal was to explore various truth-telling techniques and create a space for those not yet comfortable testifying before the TDC to share their stories. There is more than one way to share a memory, to break the silence surrounding repression. The workshop encouraged participants to discuss their experiences openly through different storytelling forms, from recording podcasts to teaching a seminar class. It also sought to empower them to bring these techniques home and foster further conversation within their communities. “It is important to let women choose the words to tell their stories and not impose on them terms to depict their suffering,” said Hela Boujneh, one of the participants. Lebanese urban anthropologist Marie-Claude Souaid, a specialist in oral history, discussed the importance of storytelling as a way of connecting the past and the present. She explained that the difficulty women face in speaking out in Arab societies is articulated around the concepts of “honor and shame.” The women in the workshop echoed this sentiment, sharing their views on the consequences of silence. While it is true that breaking the silence can bring comfort to women and help them reintegrate into society, others may be reluctant to share their stories for fear of repercussion. Salwa El Gantri, ICTJ Head of Office in Tunisia, said that addressing these fears is essential to the country’s transitional process. Mounira Kaddour is secretary general of Nissa Tounisseyet, one of the first organizations to put a spotlight on the issue of gender-related violations in Tunisia. She identified the deep polarization of Tunisian society as a major obstacle in the transitional justice process. Moreover, she worries that some victims, particularly those who suffered indirectly, may not view their suffering as “legitimate,” and that they will therefore be reluctant to testify before the TDC. Engaging them directly and providing them with alternate ways to engage in Tunisia’s transitional process is therefore critical. The workshop aimed to provide one such path. In addition to being a safe space for women to speak out, “Writing the Unvoiced” aimed to equip participants with the tools to apply these oral history and storytelling techniques in their local communities. To this end, Souaid taught participants field interview techniques and how to build trust when conducting them, especially when dealing with such sensitive subjects. 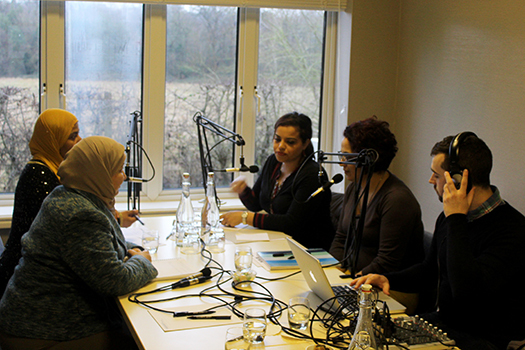 The women also learned that memorial narration is not limited to formal written testimonies, but can take several shapes – such as the podcast some participants produced, in which the younger women interviewed their older counterparts about corruption in Tunisia. The workshop was intended to be a first step in strengthening women’s engagement. One central project idea was around the creation of a platform to formally engage women that builds upon the established “Transitional Justice is Also for Women” network. The platform would be a space where women could engage in peer-to-peer education, share story-telling techniques learned during the workshop, and develop the initiatives discussed. Participants also insisted on the importance of having an independent, inclusive, and self-managed structure. As the workshop drew to a close, the women felt empowered to share their stories and realized that storytelling could be a useful tool for Tunisian women.